Steely Dan has been a long-time favorite of Jim and Tim. It's still hip today after all these many years. For all things Steely Dan including their 2007 tour schedule, audio and video clips, click to the official Steely Dan web site. 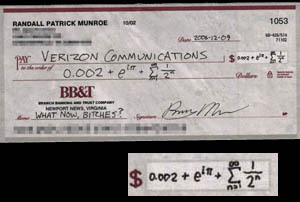 After listening to this recorded phone conversation - refer to the check image below to see how the guy finally paid for the erroneous bill. Duct Tape Dispenser ala Rick Here's Jim's cousin Rick's Duct Tape Dispenser. Rick and his wife and their duct tape dispenser (and other misc. critters who have yet to be ducttapeized) live in Park City, Utah. 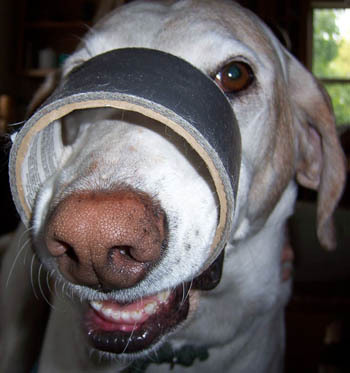 We often hear of people using duct tape to get rid of warts. Good! This means the information is still getting around. Our goal is to put Compound W out of business. With the assistance of a duct tape loving dermatologist nearly ten years ago, our web site posted this information before the medical white papers were written - and well before the media picked up on it. And now, there is another study from the Netherlands proving the same information. You can read some of our many "Wart Cure Testimonials" on our HMO on a Roll page. If you have your own wart testimonial that you would like to share, just write up the story and email it with a $20 paypal payment insertion fee* and we'd be glad to post as many as you can send us! Draw the Duct Tape Guys Our challenge (or contest as the case may be) to Draw the Duct Tape Guys is finally catching on. 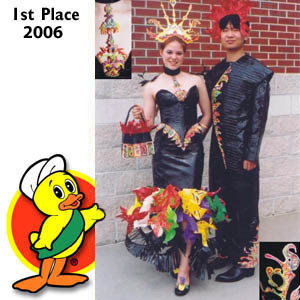 We have three new entries including the one below drawn by Dave M. of Orchard Supply Hardware - San Jose, California. Dave is one of our California Sushi buddies (hence the sushi reference). 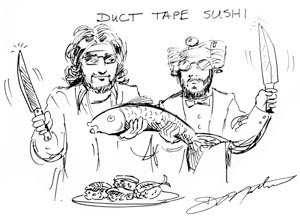 Jim isn't much for sushi - it's all bait to him - but Tim is a sushi pig. Put it in front of him and he'll eat it (unless it's Uni - that slimy sea urchin ooze). Nice work, Dave! Can't wait to see us as super heroes! To see all of the entries so far - and to prime the pump on your own creativity, click here. commercial they had the mother saying, "Honey, this is Mommy. Wake up and get out! The house is on fire!". I thought that would be a good thing to get if you had kids, but what if a wife really hated her husband? She could have it say, "George, go back to sleep. It's nothing. Just take deep breaths and lie quietly!". When I come home with food and want to eat something, I can get something that I just bought at the store, open it and eat it. When my wife comes home with food and I want to eat something, I have to open it, wash it, peel it, cut it up, soak it overnite, boil it for three hours, combine it with other ingredients, bake it for two hours then let it cool before I can eat it. I keep a copy of William Least Heat Moon's "Blue Highways" in our camper. Five Things you Never Knew Your Cell Phone Could Do - thanks to Tim's neighbor, Amy. [While not as useful as duct tape...] Your mobile phone can actually be a life saver or an emergency tool for survival. Does your car have remote keyless entry? This may come in handy someday. Good reason to own a cell phone: If you lock your keys in the car and the spare keys are at home, call someone at home on their cell phone from your cell phone. Hold your cell phone about a foot from your car door and have the person at your home press the unlock button, holding it near the mobile phone on their end. Your car will unlock & saves someone from having to drive your keys to you. Distance is no object. You could be hundreds of miles away, and if you can reach someone who has the other "remote" for your car, you can unlock the doors (or the trunk). Imagine your cell battery is very low. To activate, press the keys *3370#. Your cell will restart with this reserve and the instrument will show a 50% increase in battery. This reserve will get charged when you charge your cell next time. your phone: # 0 6 #. A 15 digit code will appear on the screen. This number is unique to your handset. Write it down and keep it somewhere safe. When your phone gets stolen, you can phone your service provider and give them this code. They will then be able to block your handset so even if the thief changes the SIM card, your phone will be totally useless. You probably won't get your phone back, but at least you know that whoever stole it can't use/sell it either. If everybody does this, there would be no point in people stealing mobile phones. information calls when they don't have to. Most of us do not carry a telephone directory in our vehicle, which makes this situation even more of a problem. When you need to use the 411 information option, simply dial: (800) FREE 411, or (800) 373-3411 without incurring any charge at all. My beloved amaryllis plant was knocked over (by me) and the stem broke in half. I duct taped the stem and it has survived beautifully. 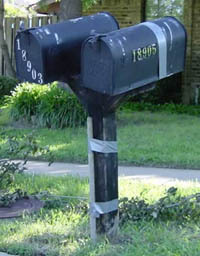 GOD BLESS DUCT TAPE! Once again, it saved the day! - Margaret, another duct tape loyal fan. "Dup Take" Many young children go through a phase where they can (and will) unnecessarily remove their own diapers. But when you have triplets, this can be an especially "messy" problem. Meet Kathryn, the "oldest" of our triplets. As the "ringleader," she led the way in untimely diaper removal. Solution: Turn the diaper around backwards so that the tabs are on the back (small children may freak at the sight of an unfamiliar gray streak on the front of their diapers) and apply a six inch strip to bind the diaper tabs together. Kathryn, William, and Laura Grace are now well adjusted 3-1/2 years olds. All thanks to "dup take," as my little ones call it. - Jim A., Huntsville, Alabama Check out our Diaper Gallery page! 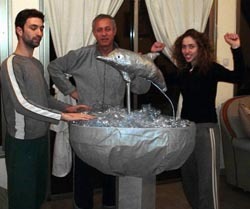 Duct Tape Dolphin Fountain We did this as prop for a new show we're performing and it took a whole day... What do you have say about our royal fountain plus duct tape dolphin? - the Adam family Well, since you asked, we think it's pretty danged awesome! Nice work! Proof once again, the family that duct tapes together, sticks together. 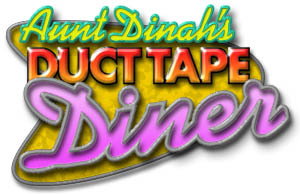 Send your famiy's duct tape creations to the Duct Tape Diner and you may get into our calendars and books! New Airlines servicing the Midwest!! WE ARE PLEASED TO ANNOUNCE LUTHERAN AIR IS NOW OPERATING IN MINNYSOTA. ALSO SERVING VISCONSIN, NORT AND SOUT DAKOTA. If you are travelin soon, consider Lutran (Lutheran) Air, da no-frills airline. You're all in da same boat on Lutran Air, where flyin is a upliftin experience. Dere is no first class on any Lutran Air flight. Meals are potluck. Rows 1-6, bring rolls; 7-15, bring a salad; 16-21, a main dish, and 22-30, a dessert. Basses and tenors please sit in da rear of da aircraft. Pay attention to your flight attendant, who will acquaint you wit da saf ety system aboard dis Lutran Air. Okay den, listen up. I'm only gonna say dis vonce. In da event of a sudden loss of cab in pressure, I am frankly going to be real surprised and so vill Captain Olson, because we fly right around two tousand feet, so loss of cabin pressure would probably mean da Second Coming or someting of dat nature, and I wouldn't bodar with doze liddle masks on da rubber tubes. You're gonna have bigger tings to worry about den dat. Just stuff doze back up in dair little holes. Probably da masks fell out because of turbulence which, to be honest wit you, we're going to have quite a bit of at two tousand feet, sort a like driving across a plowed field, but after a while you get used to it. In da event of a water landing, I'd say forget it. Start saying da Lord's Prayer and just hope you get to da part about forgive us o u r sins as we forgive doze who sin against us, which some people say "trespass against u s," which isn't right, but what can you do ? Da use of cell phones on da plane is strictly forbidden, not because day may confuse da plane's navigation system, which is seat of da pants all da way. No, it's because cell phones are a pain in da wazoo, and if God meant you to use a cell phone, He would have put your mout on da side of your head. We start lunch right about noon and it's buffet style with da coffee pot up front. Den we'll have da hymn sing; hymnals are in da seat pocket in front of you. Don't take yours wit you when you go or I am going to be real upset and I am not kiddin! And the guy lived happily ever after and went fishing, hunting, played golf a lot, drank beer, scratched himself, and farted whenever he wanted. Once upon a time, a girl asked a guy, "Will you marry me?" And the girl lived happily ever after, spending her time shopping, eating meals out, drinking good wine, completing all her Book Club readings, ignoring the housework, watching the soaps, scratching herself and farting whenever she wanted to. 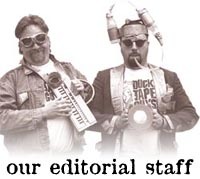 Click here for archived On a Roll Newsletters: 1/02, 2/02, 3/02, 03/19/02, 4/02, 5/02, 6/02, 7/02, 08/02, 09/02. 10/02, 11/02, 12/02, 01/03, 02/03, 03/03, 4/03, 05/03. 06/03 07/03 8/03 9/03 10/03 11/03, 12/03, 1/04, 2/04, 3/04, 4/04, 5/04, 6/04, 7/04, 8/04, 9/04, 10/04, election issue, 11/04, 12/04, 01/05, 2/05, 3/05, 4/05, 5/05, 06/05, 7/05, 08/05, 09/05, 10/05, 11/05, 12/05, 01/06, 2/06, 3/06, 4/06, 5/06, 6/06, 7/06, 8/06, 9/06,10/06,11/06, 12/06, 1/07, 2/07, 3/07.